Many Irish Fenians enlisted in the Union cause during the course of the American Civil War, seeking to gain military experience in advance of a hoped for military confrontation with the British. None had closer ties to the Fenian cause than the Phoenix Brigade, which entered service as the 99th New York State National Guard in 1864. 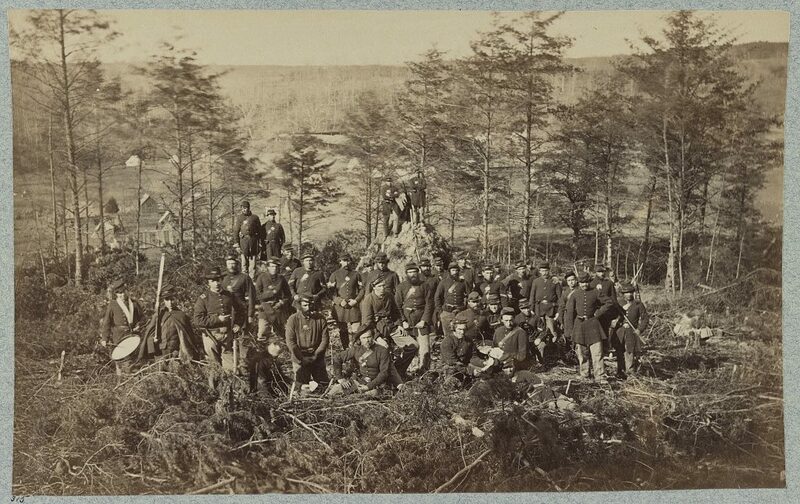 These men were posted north to guard Confederate prisoners at Camp Chemung, better known as Elmira. 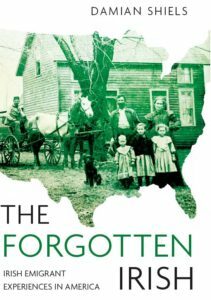 Their experiences were recorded by a Fenian writing under the pen name “Eleven Times Nine” and were published in the New York Irish-American Weekly. They are reproduced in full below. Le Fire ‘r neart ár laṁ. The United States of America: the home of the exile and the refuge of the oppressed– May the mad discord that is now tearing them asunder be speedily appeased: may they be restored to their integrity, and may their Union and Constitution live unbroken to the end of time. Ireland: the friend and ally of America, in the hour of America’s need: May her service be remembered and paid back by America, when internal peace shall have returned to her soil. The Fenian Brotherhood here and elsewhere: May it never relax its labors until its objects be gained. General Corcoran and the Fenian Brothers in the American Army. General Meagher and “the soldiers and chiefs of the Irish Brigade” in America. The Irish soldiers of America: May they prove as true to the land of their birth, as they have been to that of their adoption. The Press: the terror of tyrants. That native land of mine! 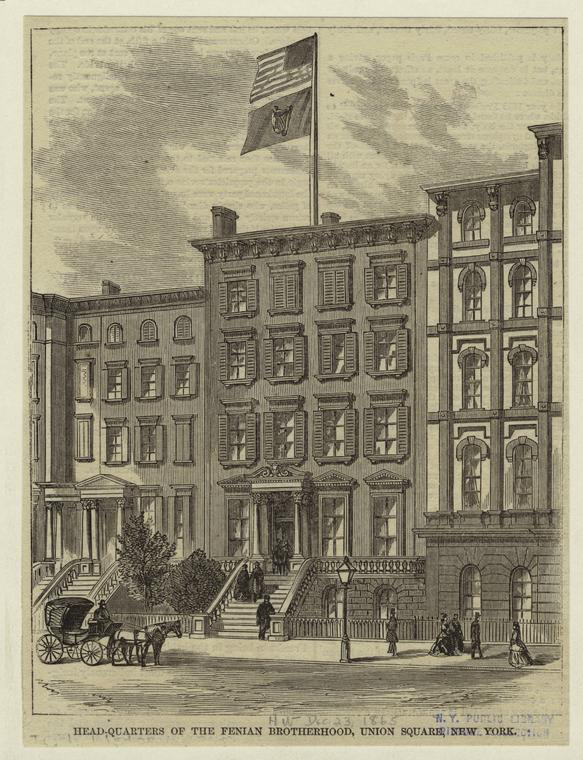 Given the ultimate aims of the 99th N.Y.S.N.G., the 100 days service of the regiment at Elmira was of great interest to those readers of the Irish-American invested in the cause of Ireland. With that in mind, the newspaper published a series of letters from the anonymous author “Eleven Times Nine”, sharing the unit’s experiences at the Rebel POW camp. These are reproduced chronologically below. Gentlemen– As this Regiment has a large number of friends in New York and vicinity, perhaps a few woes about our doings would be interesting to your readers. Since we came here “the Boys” have had plenty of work to do, in the shape of guard duty in the Prisoners’ Camp; which comes rather severe on us at times. We furnish a guard for duty round the prison wall, and a patrol inside; also guards on the buildings inside the walls of the rebel-prison. When I say “prison,” some of your readers imagine, perhaps, a large building with inn-doors, & c. Such is not the case. It is a piece of ground of about three acres, fenced all around; they live in the same kind of tents we use, except a few who are in wooden houses, or sheds, like the old Park Barracks. As dar as I have seen, they are treated very well; their rations are carted on the ground and they cook them themselves, and distribute them also. There is now something like two hundred of them to work on the canal, under a guard; of course they get paid for the work they do in the shape of an order on the sutler. Many of them would like to take the oath of allegiance but they will not be allowed. they are like Yankee pedlars, always having something to sell. they make some very beautiful fans as light as any lady on Broadway carries, from a piece of wood, the only tool used being a knife. If sold on Broadway they would bring a nice little sum, but our boys get them for almost nothing. They also make very fancy rings, breast pins, badges & c. they keep very quiet, never making any trouble, or trying to escape. The officers and men of this Regiment are frequently invited to dinner in the city and as many parties as they can attend to. Some of the boys do better in this respect than “Mr. Shoulder Strap.” The dinner invitations were quite in time the last week past, as our commissariat was rather behind what it should be; and the boys had to fall back on their friends. Now there will be plenty for them, as we are about to be mustered in a day or two, and expect to get all we want. Soldiering is very nice in good weather; but to-day it is pouring so hard on the tent where I write, and make so much noise, I can hardly hear a person calling me. Everything looks miserable to-day, the company streets are all wood; and the summer houses the boys made of trees in camp are almost destroyed. In fine weather the boys enjoy themselves playing ball, and kicking Captain Gaynor’s football; and sometimes we have a dance after supper; but we always have plenty of vocal music. It is probable we may stay here for one hundred days, and we will enjoy ourselves while we can. 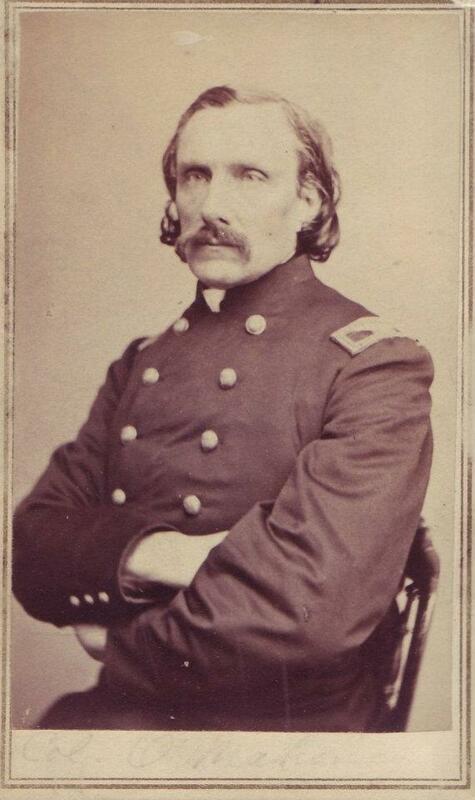 But if we go farther we will give a good account of ourselves, while we have such veteran officers as Captains Deignan, Clarke, Sullivan; Lieutenants Brennan and McMahon, and our new Lieut-Colonel Downing [former member of 42nd New York, and arrested along with Rossa in Cork, 1858]. We are now making ourselves at home, having all the conveniences that volunteer soldiers generally have. We have a sutler to the regiment, of whom we can get the little necessaries we want “on tick,” as the “boys” say,– Mr. “Shoulder-strap” enjoys himself first rate. He has his hotel on the ground, and lives as high as in New York. Since we have been mustered in, we fare much better than before, and have enough of rations, which generally consist of bread, fresh beef, or salt pork, and coffee for breakfast; for dinner, fresh beef and splendid vegetable soup, or bean soup, or both; for supper, coffee and bread. The Quartermaster is getting “posted” and will do better in future. Up to this he has had enough work for three men to do; but now that it is done, we shall get our full due. Overcoats have been served out to us, and are found very comfortable here at night.– After dark until 9 o’clock in the morning we need them as much as we should on a December day on Broadway. There was quite an excitement here the other night, caused by an officer who came into camp with a big story about the prisoners trying to get out. He reported that they had dug a tunnel from one of the hospitals outside the prison, that many had escaped, and many more were then getting out, he thought, in other places. Afterwards we found out they had only dug a hole in the ground and were just beginning to work. If they had not been discovered in time, numbers certainly would have escaped, and then we should read in the New York papers a full account of the “Battle of Chemung.” There is not much danger of any large number of them getting out, as they are too well watched. On the 31st ult., the regiment was mustered for pay, and before long we hope to see the Paymaster, who will bring an abundance of “greenbacks,” which we are now anxiously looking for. It is thought we will see him about the 12th of the month. It was rumored in camp that we were to be sent to Harrisburg or Washington; but it turned out like all other stories of Dame Rumor. It is not likely we will leave here, at least until some other regiments relieve us, as it comes very hard on those that do guard duty on the prisoners’ camp. If we leave after pay-day, very few will be sorry, though we should regret to leave our new friends in Elmira, who have treated us like old acquaintances; but the boys generally would like to see more of the country. 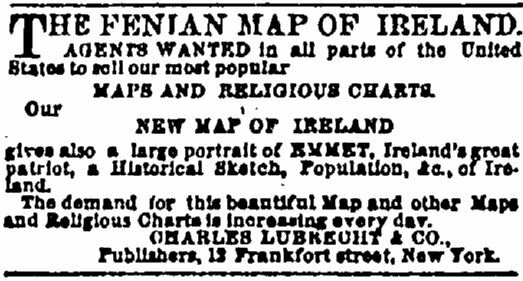 Since the regiment came here, there has been a new Circle of the Fenian Brotherhood organized in the city. The most respectable Irishmen in the city have joined and pledged themselves that nothing shall separate the Brotherhood which they have organized.– The new Circle hold two meetings in the week until they complete their organization. It is only organized a little more than a week, and gives promise to go ahead of many older ones; in fact it is ahead of some already. Capt. O’Sullivan and Lieut. 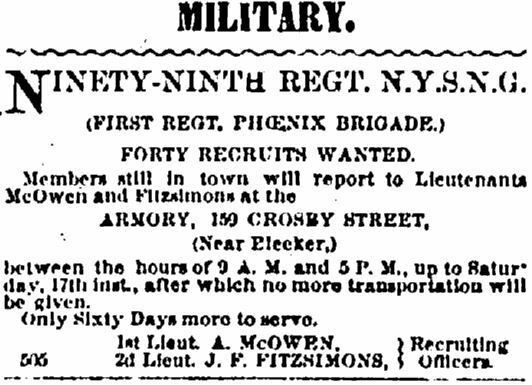 Fitzsimons have left for New York on recruiting service.– Young Irishmen wishing to join may apply to them at the armory in Crosby street. We want only fourteen men to fill every company in the regiment. Every company is full but two– Companies B, Capt. Diegnan, and G, Capt. Lynam. The regiment is now 367 strong, all told. Men who wished to escape the draft have a chance now. I must come to a close, as I have to turn out for company drill. ELMIRA, N.Y., Sept. 8, 1864. 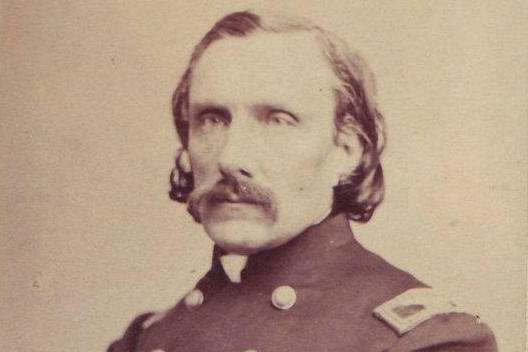 Friend Cole- We all regretted your short stay amongst us, on your way home from the Chicago Convention, especially as a very pleasant affair came off at our officers’ mess the day following your departure. The 19th Regt., Veteran Reserve Corps came from Washington to our camp ground on the 7th inst. As the officers had no quarters, and were evidently not to be supplied with any (as they were destined to be distributed in a day or so,) Col. Downing and his officers tendered and invitation to the officers of the 19th to dine at our mess. Amongst their officers is Major Donovan, formerly of the 69th Regt., Irish Brigade, and many others, veteran friends of our officers. The invitation was accepted by Col. Dayton, for himself and his officers, and the result was a pleasant, cordial reunion of these “heroes of many battles,” and their friends of the 99th. Toasts were drank, speeches made, partaking of the characteristics of American and Irish effusions. “The memory of our fallen brethren” was responded to in the most feeling and genuine manner, and the only unpleasant occurrence in connection with the whole affair, was the reflection that the “gallant Nineteenth” were about to leave us. After the banqueting was over our officers, at the invitation of Col. Dayton, visited the camping ground of the 19th, where they were received in a handsome manner, the splendid band of the “Veterans” welcoming them as they came. Having waited to witness the dress parade of the Regiment, the 99th bade adieu to their friends of the 19th, and retired to their encampment. I cannot recollect a more graceful or cordial event than this I have described. W.L. Cole, Esq., Editor IRISH-AMERICAN. P.S.- great credit is due to the caterer for the mess, Mr. Lynch, of Elmira, who is really a good fellow, and upon a very short notice got up a splendid and well appointed dinner. Since my last, nothing has transpired of much importance that would be interesting to your readers beyond a grand reception given by the officers of the 99th to those of the 19th Regt. Veteran Reserve Corps. The officers were entertained by the officers of the 99th at their Mess Room. The veteran officers of the 99th recognized in them old companions who fought with them on many a well contested battle-field in the Irish Brigade, Irish Legion, and the gallant old 69th. It was a meeting between old friends that will not soon be forgotten by either party. The 19th Regt. did not stay long, but I have no doubt they will remember it as long as the 99th. Your correspondent was not in camp at the time, so cannot give details. The nights are now beginning to get very cold and we need our overcoats, blankets, and a [illegible] extra clothing. Some of the boys have built fire-places in their tents and are quite comfortable at night. The best fire-place in camp is one built by Capt. Deignan.- He has his tent as neat as a little country cottage: he built a chimney that is conspicuous in the camp, and shows he is quite as adept at house building as he is in the art of arms. I must not forget to mention another beautiful canvas cottage belonging to Lieut. McMahon, who has his tent ornamented with evergreens, & c., and a grass plot outside: he is also an old soldier. There have been two rival clubs organized in camp- the object being mutual benefit and enjoyment– one, “The Knights of Chemung,” of which Capt. McDonough is the presiding officer, or, “The Great I Am,” as he is called. Our rollicking Adjutant, Norris, is the scribe. They had a very interesting time a few evenings ago, on the occasion of a very sociable meeting in the Mess Room, enlivened by wine, songs and declamation, after which they adjourned to dance the “War dance,” dressed in all kinds of fantastic garbs. The other association is the “Knights of the Shamrock,” also organized for social enjoyment and improvement, and is almost the same as the “Knights of Chemung,” but with this difference– they meet three times a week for improvement and debate in military tactics, and every member must wear the “chosen leaf” at all meetings for social enjoyment, and also when they meet for improvement in drill, and debate on military matters. They all have “knightly titles,” and if any member calls another by any other, he is fined as the “Order” may direct; but the fine is imposed only at meetings and in the Mess Room. Capt. Deignan is President; and Lieut. Power, Secretary. If any member should be intoxicated (which has never been the case yet), he is fined very heavily. Last evening, when we were in the line at dress parade, a great commotion was caused by a report that the rebels had broken out. The soldiers who were out of the camp came running in double quick time to seize their arms; the long roll was beat in some of the other regiments at the same time. Lieut. Col. Downey gave the order to load at will, and we stood for about ten minutes expecting orders, after which we went through the parade. It turned out to be a hoax; not event an attempt was made by the “Johnnies” to get out. They had a good laugh at us afterwards when they heard of the excitement we were all in. If any considerable number of them did chance to get out at the time, they would not have much chance of escape. There are so many soldiers at this post, that it is doubtful if one hundred would escape, if every on in the prison did get out: but there are many who would not escape to join the rebel army if they had a chance. Some say they are not in favor of the rebels, and never were, but were forced into the army, and were glad when taken prisoners. They now get as much to eat as when in Dixie, and are quite satisfied, but for the confinement, which is not agreeable to any man. The Paymaster has not yet made his appearance; but we expect he soon will. Quite a large squad of recruits came up from New York this week, and were very much pleased with the camp. After this week no more will be accepted, unless we stay one hundred days more, which is not likely. It was rumored that all the militia who would volunteer one hundred days more to guard the prisoners would receive a bounty of $100; while some make it $150. Many of the boys are quite willing to stay; but it is doubtful if we do, as an organization. This week a squad went to guard substitutes to the front, under Lieut. Power. Gentlemen– We are still in the same place, and doing the same duty– guarding the “Johnny Rebs,” substitutes, and “bounty jumpers,” who are in hospital. Some of these fellows have made a trade of cheating the government, by enlisting and getting Uncle Sam’s greenbacks, and then they skedaddle the first chance they get. Very often they pretend to be sick, in order to be sent to the hospital. Some jump off the cars when on the way to the front, and are fired at by the guards and wounded before they see the enemy. There are many such cases now in the hospital here. The city is full of bounty jumpers and recruiting agents, who try to enlist men, and afterwards try to get them away for a consideration. Our regiment has been much improved in discipline and drill; as, however, we formerly drilled three times a day, one is now dispensed with, so that we have but company drill in the morning, and battalion drill for about two hours and a half in the afternoon, under Lieut.-Col. Downey, a veteran tactician; after which comes dress parade. The proper authorities in New York should see that our regimental armory is repaired and put in shape the time we get home. It is a shame they have not attended to it before now. As it is, we will have to put a guard over our arms when we get home. During six months before we entered the United States’ service, some companies paid for their own drill rooms. This should not be; we should have all we are entitled to. It is the fault of the Board of Supervisors that we have not an armory to drill. We have been a militia regiment now about one year, and have not our State uniforms yet. Whose fault is this? The proper authorities should see that we have all we are entitled to from the State at the expiration of our term of service. The new Circle of the Fenian Brotherhood in Elmira is getting along famously. It was organised about six weeks ago. Last week the Circle had a ball; most of the officers of the 99th attended, with some others of the militia regiments stationed here; and all seemed to enjoy themselves well, and were much pleased. Nothing was left undone by the managers– Messrs. Sullivan, McCarthy & Co.– for the comfort and enjoyment of all present. The New Yorkers were a little puzzled when the dancing commenced, the figures are so much different from the style we are used to; but after a while some were quite “O.K.” Before we go home, the “Knights of the Shamrock” propose giving a theatrical entertainment in camp. We have some professional actors in the regiment, and no doubt but we will have an interesting time. The weather here, so far, is very fine considering the season of the year, and the days are pleasant and agreeable; but the nights are rather cold without overcoats; but the men do not mind that much, when they have a large fire, plenty of music, songs, and dancing, as we generally have every night. A few evenings ago, Co. G had quite a large party in their quarters, which ended after ten o’clock. They had Irish reels, jigs, quadrilles, &c., also declamations and songs. As I write, Co. B is projecting a dance in their quarters. The boys are in the best of spirits, and enjoy themselves as well as at a New York ball, if one can judge by looks. If our New York friends could look on for half an hour, when our dancing parties are going on, they could not help enjoying themselves. Soldiering is not quite so bad as some persons at home think. Every evening the boys have some new sport, either a dance or social gathering, to pass away the “dull hours” of camp life, although the hours are not dull here. The rebel prisoners have been at work again tunnel digging. This morning an underground passage was discovered, leading outside their camp, where several must have gout out last night. A few were captured, and are in close confinement in No. 1 Barracks. CAMP 99TH REGT. 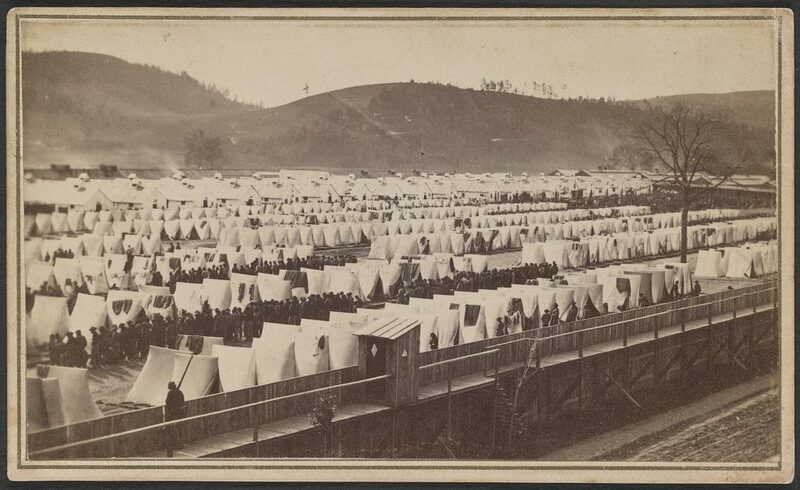 N.G.S.N.Y., CAMP CHEMUNG, ELMIRA, Oct. 29, 1864. Gentlemen– The weather in this part of the country has been very fine and agreeable until yesterday, when it commenced to rain in torrents. Almost before the guards arrived at their post they had their clothes wet through. There was to be a grand review of troops yesterday afternoon, but it had to be put off on account of the inclemency of the weather. Our men were busy the preceding days washing, polishing, and brightening their arms and accoutrements, to make a good appearance; every man was clean, and in the best of trim; when they woke up in the morning, all the work was to no purpose; the muskets and brasses were all rusty; belts and shoes and cartridge boxes were wet and dirty, and, in some cases, their clothes were wet through. It continued to rain all day, until 10 o’clock this morning. Some of the tents fell down, and the owners of them had a very unpleasant putting them up. Our term of service is rapidly coming to a close; we have only twelve days more to service. Our time is up on the 10th of November, just late to loose our votes for McClellan. We are told we cannot vote unless we are in New York City, or out of the State, on election day. The commandant of the post has expressed his desire to have all the militia regiments volunteer for one hundred days more. By what I have heard the men in the other regiments say, the would stay one hundred days more if there is a bounty offered, and barracks built. If the barracks were built, and a bounty offered I have no doubt but all the regiments here would re-enlist in a body. There are wooden huts being built for the rebel prisoners, and I have no doubt but the Government will build the same for the soldiers guarding them, if asked to stay. The rebels are becoming very restless here lately in their eagerness to escape; almost every day some new plan is discovered they had made to escape. This week another tunnel was discovered partly made, but the workers were not found out. Last night, Corporal Herrick, of Co. B, discovered two coming out with his relief; they had on the blue pantaloons and cap, and an oil blanket like our men, and would have got away but for the vigilance of the corporal in counting the men. When they found they were discovered, they ran away, and only one was caught, and accommodated with quarters in the guardhouse. There has been another new club organized by the officers, entitled the “Social Seven.” It was organized by seven officers. hey gave their first social hop last Tuesday evening, in their mess-room; the dancing continued until a late hour, when they adjourned for refreshments, where song, wit, and hilarity prevailed; during the latter part of their jollification, the long roll was beat, and the “Social Seven” were out in double quick time, with their commands, and awaiting orders from head-quarters. After waiting about fifteen minutes, the brigade commander came and ordered the Regiment to its quarters, to be ready to turn out at a moment’s notice. We are now getting used to such false alarms. We have generally two every week. The “Social Seven” give a hop every evening, when the dancing is kept going until tattoo. The officers are– President, Capt. J.D. Clarke; Secretary, Lieut. J.T. Fitzsimons; Treasurer, Capt. A.J. Diegnan. Long after our term of service has expired, we shall recall with pleasure the many happy reminiscences of the 99th. 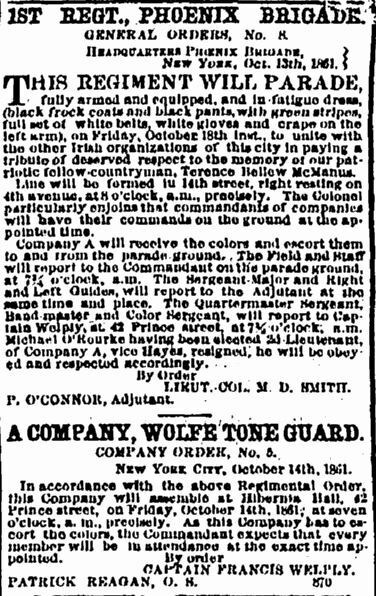 If the Regiment returns to New York at the expiration of our term, we are to have a grand ball at the Academy of Music, or some other spacious Hall, instead of the one the “Knights of the Shamrock” were to have in camp. The rain has now stopped, and the day is turning off clear and bright. Fatigue parties are cleaning up the camp, while the others are cleaning up their tents, muskets and accoutrements, for inspection to-morrow and the weather-interrupted review that will probably come off on Monday or Tuesday. There are white gloves coming from New York for the Regiment, and we expect to make a good appearance. To-morrow we will have Mass in our camp; it is two weeks since we had Mass in camp before. There is only one clergyman in this city; but the traveling priests who visit the country villages visit our camp. We have visits from the priest in Elmira very often, and he invites us to church. The correspondence of “Eleven Times Nine” offers a fascinating insight into the camp service of this group of Fenians, as they sought both to aid the American Republic and gain soldierly experience to take home to Ireland. We will return to the topic of Fenians in the Union military in a follow on post, which will look at links between members of O’Donovan Rossa’s Phoenix National and Literary Society and the American Civil War. New York Irish American Weekly. 29 March 1862, 17 January 1863, 6 February 1864, 13 February 1864, 26 March 1864, 3 September 1864, 10 September 1864, 24 September 1864, 22 October 1864, 5 November 1864. Bruce, Susannah Ural 2006. The Harp and the Eagle: Irish-American Volunteers and the Union Army, 1861-1865. Kane, Michael 2002. ‘American Soldiers in Ireland, 1865-67’ in The Irish Sword: The Journal of the Military History Society of Ireland Volume 23, No. 91. O’Donovan Rossa, Jeremiah 1898. Rossa’s Recollections. Savage, John 1868. 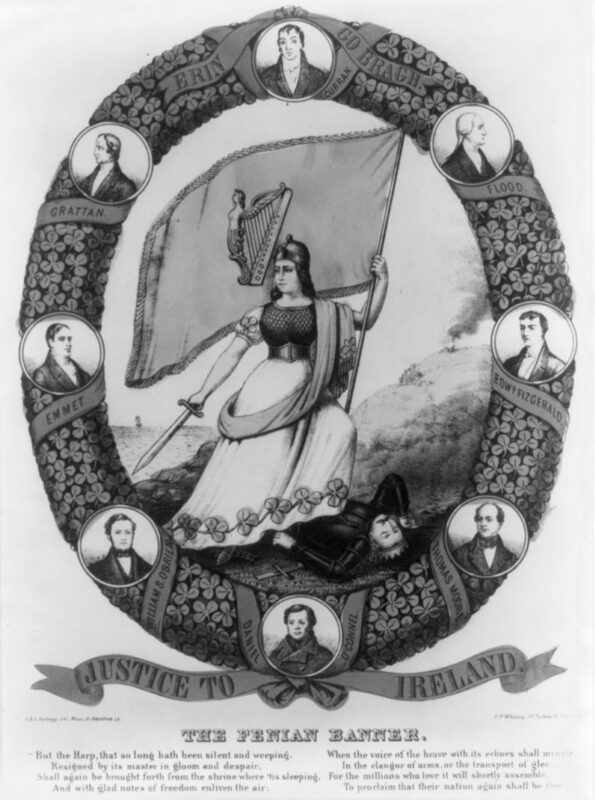 Fenian Heroes and Martyrs. Glad you enjoyed it Thomas! I was completely unaware of this. Thanks for the enlightenment.